NEW BRITAIN - It was only four years ago when Innovation was trying build a girls volleyball program that could just go out on the court and be competitive. Now, the Ravens are looking to continue their quick rise from a starter program to one they believe is a consistent contender for titles. So far, Innovation has the results to back up that belief. Under fourth-year head coach Matt Lance the Ravens have made strides each and every year. Innovation finished 9-14 in its first season - its only losing record thus far - before going up to 13 wins in 2014 and 16 in 2016. Last season, the Ravens went 20-4, won the CRAL regular season and tournament titles, qualified for the Class S state tournament and reached the quarterfinal before falling to Holy Cross. Innovation will not only try to build off that success, it will have to deal with a jump in classification, having been bumped up to Class M. But the Ravens are looking to achieve something that has never been done at Innovation. The Ravens are shooting for their first state championship. With six seniors returning, they believed they are poised to do it despite losing nine seniors to graduation. Lance reassured the girls during the first day of practice. He told them it was great they were successful the previous year and no one can ever take that away from them, that it will always be a part of their success. He also informed them that this year is going to be different. Innovation will be returning Morgan Sarto and Danelys Baez-Arroyo. The dynamic duo will be taking on the big stage for the Ravens once more. Last season Sarto was an outside hitter, but is likely to be stepping up as a libero. 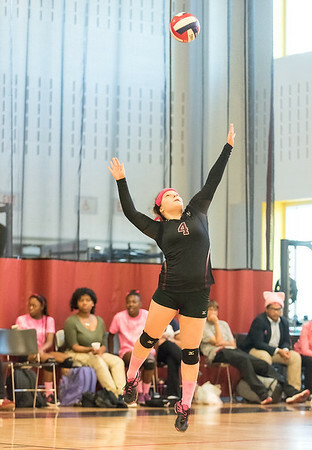 Baez-Arroyo will continue her role as an outside hitter. Innovation also has two-sport athlete Aaliyah Walker. She saw more time on the court as the season progressed, but Lance believes she will be a leading threat this year. Getting through the Class M tournament isn’t going to be an easy feat. But Lance has already made some changes to ensure his team’s success. “We did schedule a little bit more of a tough schedule in the beginning [of the season],” Lance said. “I told the girls that it’s going to help when the end of the season comes. You have to face those strong teams if we’re going to play in the playoffs. Innovation has added six difference schools to this season’s schedule, although two are scrimmages - Bunnell and Maloney, two Class L teams - the rest of the season will include Bolton, St. Paul, HMTCA and Wheeler. Posted in New Britain Herald, Innovation on Thursday, 30 August 2018 18:24. Updated: Thursday, 30 August 2018 18:26.